Few courses in North America can stir a walking golfer’s soul like Ballyneal, which boasts golf that is so pure and natural that Old Tom Morris would approve wholeheartedly. Ballyneal is still somewhat of a hidden gem that is slowly being discovered as golfers venture into the chop hills of North Eastern Colorado, about 3 hours from Denver International Airport. The club is private, laid back and only reached after driving several miles along a dirt road located a few minutes south of Holyoke. While you may be “in the middle of nowhere”, the passionate walking golfer will feel very much “at home”. A sunset walk at Ballyneal is pretty close to golf nirvana. Ballyneal was carefully routed over and around the chop hills by Tom Doak – and this could very well be his masterpiece. It is probably the most natural course I have ever played in North America because it melds seamlessly with the environment as the golfer journeys through a unique and beautiful landscape. Dave Hensley and his team keep Ballyneal playing firm, fast and fun by using very little water and only managing the fescue as necessary on fairways and greens. The experience at Ballyneal is heightened by an excellent staff that create a laid back and welcoming atmosphere at the club. It is, absolutely, inland dream golf on a course that changes day to day and hour to hour as wind and weather move through the property. Ballyneal is so pure that there are no yardage or tee markers. It is a match play course with serious distance elasticity depending on the wind and where you happen to put your peg in the ground. Creativity abounds at every green and many approaches can be played along the ground or through the air. While Ballyneal is not a “true seaside links” it certainly plays like one. For a walking golfer, there can be only be a handful of experiences that rival time spent at Ballyneal – especially if you are on the property with friends. Having finished a round at Ballyneal there is nothing a walking golfer would rather do than walk right back to the first and tee it immediately. Ballyneal receives a 3.5 out of 4 for walkability, because the routing is so strong that elevation changes are barely noticed. Most of the green to tee transfers are very short – in fact – you can often tee it a few club lengths from the hole. 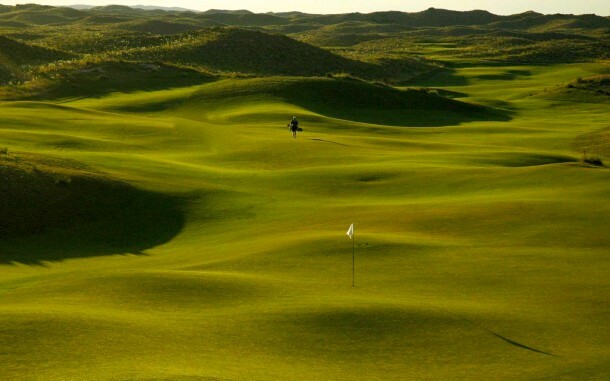 54 holes a day at Ballyneal should not be a problem for the fit walking golfer. The Architecture and Aesthetics at Ballyneal are world class. While there are no ocean holes, the chop hills provide a spectacular setting for the game. As mentioned, the course is routed seamlessly over the terrain and paced wonderfully. A more fun or interesting set of green complexes may not exist anywhere else in the country. Ballyneal is an easy 4.0 out of 4 for Architecture and Aesthetics. In terms of Strategy and Playability, Ballyneal receives full marks. The fairways are wide enough to handle strong winds, but strategy is always important off the tee as ball placement provides a significant advantage on most holes. Ballyneal is the type of course where the stick will have to work to score well, because it is tough to get the ball close to the hole on approaches, but the bogey golfer, if he plays smart, can navigate the course while playing to his handicap. Ballyneal is The Walking Golfer’s Top Modern Golf Course in the United States. It is a walk that should not be missed if you ever have the chance to play there. Ballyneal looks great and we get out to Colorado every few years so it would be within striking distance. Being private, is it difficult to get on? Hi Mark – I would suggest that you contact the club – they may be able to get you out so you can see the course. Ballyneal has offered “app to play” in the past years for those interested in playing the course once or looking into becoming a member.